Starbuck meets the mysterious Slick and Boomer betrays everyone once again. What follows is a review of “Someone To Watch Over Me.” Beware the spoilers if you haven’t watched it yet. While the quote in the title of this post is actually from J.R.R. Tolkein, I thought it also summed up both Starbuck’s and Boomer’s storylines in this episode. Starbuck feels lost, but seemingly has a direction even if she isn’t aware of it. Boomer, on the other hand, has a definite direction — and one possibly programmed into her by John Cavil — and yet is one of the most lost characters on the show. Starbuck is making use of her free will even if her journey has been uneven, but Boomer has no free will. Since we know that John Cavil programmed the Final Five for maximum misery, we know he has the skills to make Boomer indeed into his “Pet Eight” as Ellen has called her. This “in-betweenness” motif is hammered home twice more in this episode by dialogue such as Starbuck claiming that the Watchtower song “made me feel happy and sad at the same time,” and Slick saying “[Y]ou’re asking the wrong guy. I’m just a piano player” despite us knowing that he has to be much, much more. This motif is reinforced even more by her father’s first name “Dreilide” which means “third eyelid” in German and describes usage of one’s Third Eye. Esoterically, those described as using their Third Eye are considered seers — like Pythia. Seers see into both the corporeal world and the Otherworld, sometimes into the future. It’s really when Starbuck embraces both her past and accepts the unknown of her future is she able to play the Watchtower song and transmit that song to the Five. 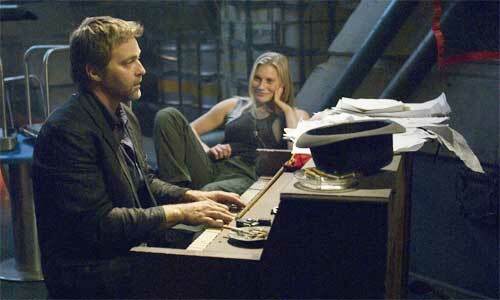 It may be that the song is always being transmitted, but that the Five need an amplifier: Starbuck. The first time they heard it was when Starbuck returned via the Ionian Nebula and now this second time as Starbuck actually plays the song itself. Starbuck will only know the path to take when she is no longer invested in either the Colonials or the Cylons, or perhaps when she is invested in both sides equally. Either way she will exist betwixt the two groups. In “Deadlock” Roslin asked Caprica if she’d had any further visions of the Opera House. Neither woman had since Caprica’s pregnancy. That was the first reference to the Opera House in quite some time. In “Someone To Watch Over Me” we have yet another reference to the Opera House. This time it’s from the recording Helo recovers for Starbuck of her father performing “Live at the Helice Opera House.” We also have Starbuck saying to her father at one point: “If you want to be an immortal composer, you better learn how to play that thing first.” (emphasis mine) Dreilide is either one of the Lords of Kobol or some incarnation of Number Seven “Daniel the artist” — or both. If Daniel managed to survive whatever foul play John Cavil dished out to him he may have evolved into some other new form that was not quite corporeal. Let’s say both the Colonials and Cylons are all some sort of artificial life-form. IOW, the “they’re all Cylons” idea. What if because of the nature of Cylons, Daniel/Dreilide can not only manifest as a head character, but also manipulate a person’s programming as well? And if he merged a bit of his own programming with someone else’s in this way, wouldn’t this create a kind of offspring? We’ve been told that Starbuck is not “Cylon,” which I think means she’s strictly not one of the Cylons the Colonials or Final Five created. Perhaps Daniel/Dreilide aspires to be some sort of Immortal Composer, but he hasn’t quite learned how to play the “song of creation” correctly yet. He’s been able to create and recreate Starbuck, but couldn’t leave his work/art as Socrata wanted him to because his art was creation in a very fundamental sense. In Joe’s Bar, Ellen flat out says to Tyrol that “We can’t interfere. We can’t set ourselves up as gods.” The natural ending to this sentence for me is “like the Lords of Kobol did.” It lends credence to the idea that Kobol was the last attempt in a long pattern of Cylons and humans living together in peace. The question becomes what purpose Cavil has in kidnapping Hera, and quite frankly I canâ€™t think what his interest might be other than to kill her; she represents very powerful evidence against his assertion that even the humanoid Cylons are nothing more than machines, and I wouldnâ€™t be surprised if he regarded her as a threat of the worst order. Which, now I think about it, would tie things up handily if it were the case. Cavil dismissed the ramblings of a basestar hybrid as â€œvomit[ing] metaphysics,â€ which I note is rather an analog to Lee Adamaâ€™s dismissal of Pythian prophecy as â€œramblings.â€ At the same time, we know for a fact that the Leoben Conoy-model Cylons view the Hybrid utterances as the articulation of the mind of God â€” it doesnâ€™t seem like much of a stretch to think that somebody could have had the same view of a Thirteenth Tribe Hybrid and thus undertaken to record her every saying. In a deleted scene of “Kobol’s Last Gleaming Part 1,” Elosha tells Adama that one of the Kobolians wanted to be raised up higher than the others and this is what broke the peace between humans and the Lords of Kobol. This Jealous God seems to have quite a few similarities to John Cavil. I’ve been assuming a connection between this Jealous God and The One Whose Name Cannot Be Spoken, but I’m now wondering if this latter title refers to Daniel in the form he took after he survived Cavil’s assault (see #2 above). He might have existed as some kind of non-entity without a name. Each of us plays a role; each time a different role. Maybe the last time I was the interrogator and you were the prisoner. The players change, the story remains the same. And this time â€“ this time â€“ your role is to deliver my soul unto God. Do it for me. Itâ€™s your destiny. And mine. While I haven’t quite figured out who’s who yet, Hera does seem to be linked to Pythia, Daniel/Dreilide may be an incarnation of The One Whose Name Cannot Be Spoke, and John Cavil may be connected to the Jealous God. The only other Lord of Kobol of significance is Athena, who committed suicide by jumping off a cliff, which sounds very similar to Starbuck flying into the maelstrom. Most viewers are assuming that Boomer is heading back to John Cavil and this may indeed be the case. However, where does Tryol think Boomer is going to? He obviously had no knowledge of Hera’s kidnapping and would never even entertain the idea of sending Boomer back to Cavil. The only alternative I can think of is Tryol thought Boomer was going to search for a habitable world. Also, I’m inclined to believe her when Boomer claims to really love Tyrol because I do think she’s programmed to be Cavil’s “Pet Eight” without the ability to truly act on her feelings. This was the case when Boomer shot Adama as well — she didn’t want to do it but was compelled to. Possibly programming Boomer to his will and using the inhibitor chips in the Centurions lends even more credence to John Cavil’s connection to the Jealous God. Others have theorized that Adama is in fact the dying leader mentioned in the Pythia Prophecy, or that the Galactica is the dying leader. I still think it’s Roslin and I think that while her stopping medication hastened her death, Hera’s kidnapping may be what finally does Roslin in. The brand of â€œTauron toothpasteâ€ offered as a prize to the pilots is called â€œFelgercarb,â€ a word used in the original series to mean â€œshit.â€ Tauron comes from Taurus the bull. In essence, Kara is offering the pilot who finds a new planet â€œbullshittoothpasteâ€.